Built to stand up to hours of Full HD video recording, the SanDisk High Endurance Video Monitoring microSD Cards provide the capacity, performance and exceptional reliability today’s home security and dash cams demand. They’re also protected against extreme temperatures, shock, water and x-rays, so you can be confident the evidence is there when you need it. 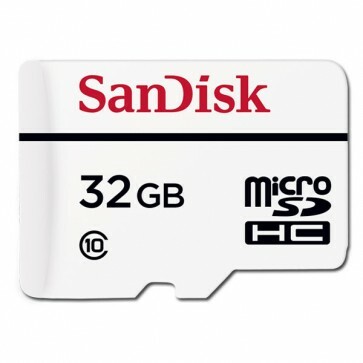 SanDisk High Endurance Video Monitoring Cards are available in capacities of 32GB and 64GB. SanDisk High Endurance Video Monitoring Cards have the speed to shoot Full HD as well as HD video. Whichever your system requires, our card delivers exceptional reliability. Proven to operate in temperatures from-25C to +85C. SanDisk High Endurance Video Monitoring Cards work in all weather, from desert heat to winter cold. And it’s rigorously tested and proven to stand up to shock, water and x-rays to give you the durability you need.